Malted cider or un-hopped apple ale? So as I mentioned in my last few posts, I have a juicer, and I have a bit of extra malt. So why not try throwing some malt into some apple juice and see what happens? 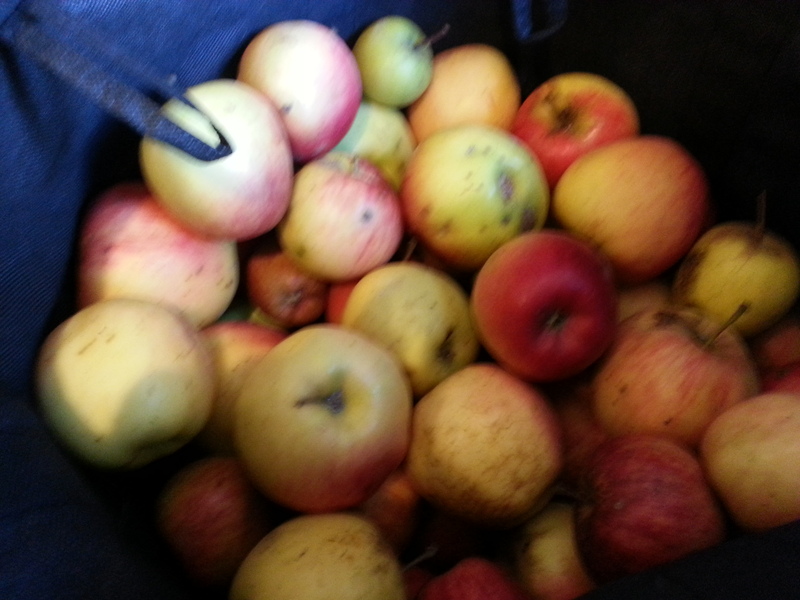 I went down to my local market and found a pretty good deal on organic juicing apples, i.e. apples that aren’t pretty enough to sell as eating apples. I bought a hell of a lot – about 7 kilograms! I had read in various places that you get about 1 litre of juice from 1-2 kilograms of apples, so I thought that this would be enough for about 4 or 5 litres of juice. Unfortunately I was pretty wrong and only got about 2 litres. I’ve since found out that this ratio works better for apple pressing, which is a much more efficient method of extracting juice. Using a juicer like I have tends to lose a lot of juice to the pulp it creates. I’m not going to go out and buy a juice press, but next time I may try squeezing out the pulp. We’ll see. Anyway, after cutting up a whole bunch of apples and juicing them, I wasn’t left with the amount of juice I thought I’d get. 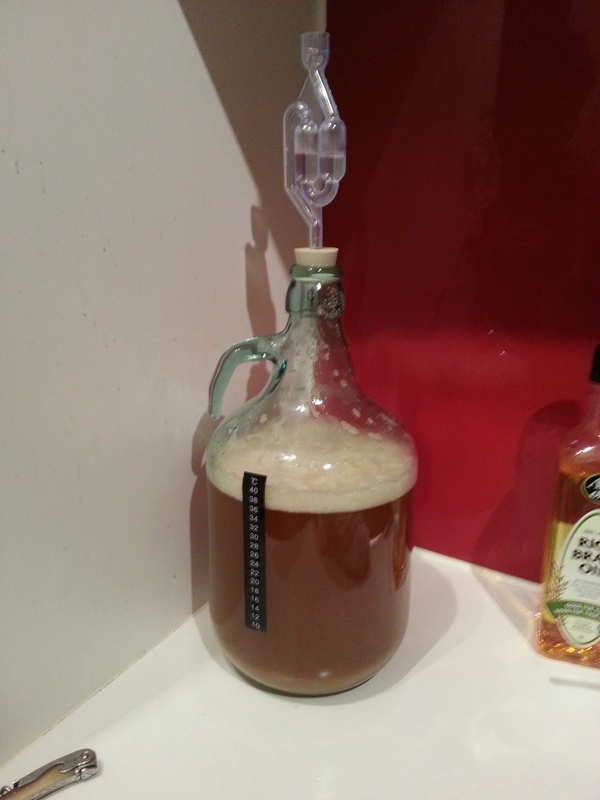 So from there, things began to turn into an un-hopped apple beer rather than a malted cider. I set my 2 litres of juice to boil and added a cup of golden light liquid malt extract. The hot break was huge on this one; the pot was only about a third full, and it still nearly boiled over! Once that was under control, I let it boil for 15 minutes while I did some cleaning. After the boil, I let the bottle sit in a sink full of ice water for 10 minutes, emptied the sink, and then filled it up again for another 10 minute bath. Once this wort was in the carboy, I topped it up with about 2 litres of water – so this batch is going to be 4 litres in total. The yeast i used was an SN9 wine yeast. It’s what I had on hand, but, considering there’s malt in there, I probably should have gone and used an ale yeast. That’s something to experiment with later. The wort was tasty. It wasn’t overwhelmingly apple-y or beer-y, but had good hints of each. So I’m confident I’ll get something interesting out this. The OSG was 1.028, which is a little lower than I would have liked. As a lot of that sugar is fructose, I should be able to get a final gravity pretty close to 1, so that’s promising. Alcohol content should be around 4% after bottling. I’d like to see if I can push the alcohol content a bit higher, so I might add some dextrose next time. Of course the other option is adding more malt or juice, but, assuming the mixture of flavours is good, I don’t want to upset this balance. Dextrose won’t alter the flavour. Assuming this turns out tasty, I’ll also look at hopping it, which will make it a proper beer. So we’ll give this a week and see what happens! This is your attempt to turn me into a cider fan isn’t it? Well it won’t work! This is whats known as a graff. I make them quite a bit. They go over pretty well in the summer.